Salt, a necessity for all living things, has been receiving somewhat of a bad reputation the past few years with admonishments for us all to eat less of it. And perhaps we do eat too much, particularly if we are consumers of processed food, but life on earth wouldn’t last long without it. All animals and plants need at least trace amounts of salt, and humans are no exception. Not only is it important to life, but also to the betterment of that life. Once humans realized that salt could be used to preserve food it allowed them to store food for times of hardship or famine. Early humans would have collected the saline crust on the rocks along the sea shore, or that left behind in dried up tidal pools. Soon however, they found that some places had deposits of salt in caves and they began to mine for salt. Salt was so important that even in the Bronze Age there were long distance trade routes to carry salt to places where people had little access to it. By Roman times salt was used to pay the soldiers and the word salary comes from the latin phrase “salarium argentum”. In Ancient China a tax on the salt trade brought in almost as much revenue as the tax on land. Governments rose and fell dependant on how well they controlled the production and trade in salt. There is a great book on the history of salt by Mark Kurlansky which is well worth reading. Salt can be harvested in two main ways, from the sea or from the land. Sea water is either boiled to evaporate the water leaving the salt behind, or it is collected in salterns where mother nature evaporates the water naturally. Dried up sea beds and rock salt deposits buried beneath the earth can be mined for their salt. Himalayan sea salt comes from high up in the mountains where it is dug out from what was once an ancient sea. It is not processed and therefore contains more traces of beneficial minerals than common table salt. 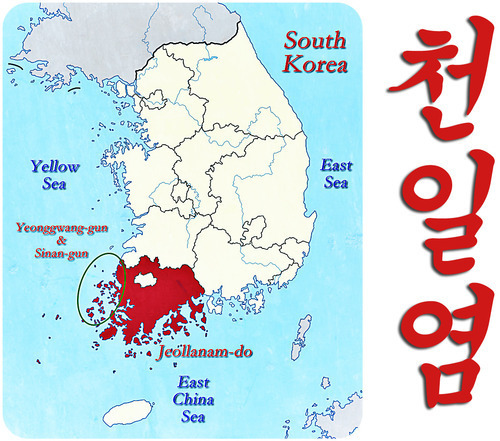 Korea being a peninsular is almost entirely surrounded by the sea, and Korean salt was traditionally made by boiling shallow pans of sea water until the water evaporated off and only the salt crystals were left behind. This was the most ancient and perhaps easiest method of collecting salt. However, at some point around the beginning of the 20th century another method appeared that allowed for salt collecting on a larger scale. Korea has some of the best and largest mudflats in the world, so much so that they have become biosphere reserves and have been recognised as ecological treasures by the Korean Government. 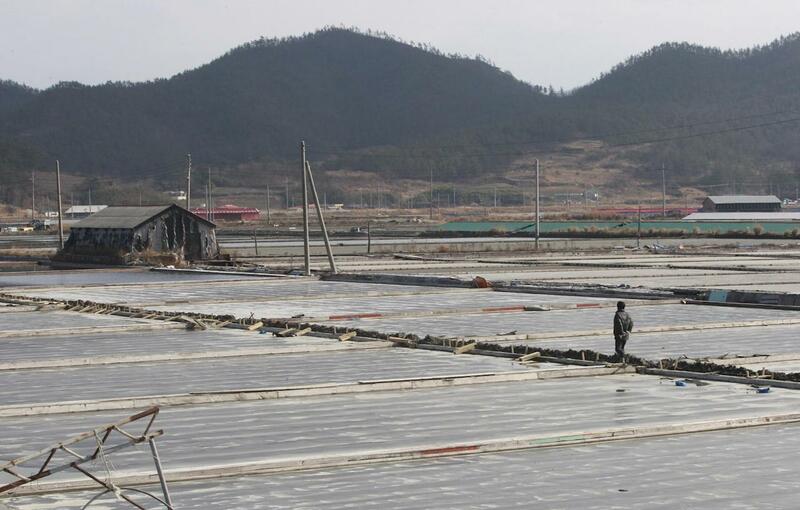 Sinan-gun and Yeonggwang-gun in Jeollanam-do are among the best and oldest areas of ‘solar’ salt production in Korea, and salt harvesters ‘farm’ the mudflats in an eco-friendly way, allowing conservation of the natural resources while providing an income for the local economy. However, since salt harvesting is extremely hard there have been accusations that disabled people have been forced into semi slavery in order to keep costs down. Sea water is allowed to flow into large reservoirs, where it is held until it is allowed to flow into evaporating ponds, where the sun and the wind begin the process of creating salt. After a while the sea water is sent to another evaporating pond. It remains there for a while before it heads to the crystallizing pond. At each stage as water evaporates the salinity increases and it comes closer to being salt. It takes 2 to 3 days for salt to crystallize and a further 3 weeks or so to turn into salt. It however takes almost 3 years before it can be sold as the salt is stored for a long time to remove the bittern, a bitter tasting solution of sulfites, bromides and other natural chemicals. Korean solar salt contains trace amounts of minerals said to be good for one’s health and is considered a high quality salt on a par with Maldon Sea Salt from England, or the French Sel de Guerande. It is a somewhat coarse, large grained salt, with semi transparent crystals. It can come in grey or white and has a very slight sweetness to it. It is ideal for making kimchi, fish sauce, and other fermented foods as the large grains dissolve gradually enhancing the process. Korean solar salt can also be used as a finishing salt, which means the kind of salt, like table salt, that you would add to your food after it has all been prepared. To see if you can actually taste the difference between different salts you can experiment by using slices of cucumber and sprinkling a little of each salt on different slices. I’m not an expert, but I can taste a slight difference with some salts. If you are substituting one kind of salt for another in a recipe you have to be somewhat cautious as not only are some salts more, or less, salty than others, but the size of the grain can also make a difference so you would probably want to substitute salts with similar sized grains. Korean sea salt is remarkably cheap in Korean grocery stores so it is well worth buying some and trying it in your kitchen. Pythagoras once wrote, “salt is born of the purest of parents, the sun and the sea.” Salt is necessary for life and is also an integral part of us, it is in our sweat, our tears and in our blood. It is part of our daily bread, and makes all our other food taste good too, so maybe it is time to throw away that chemically processed, iodine enriched, table salt that contains anti caking agents and other added chemicals and go back to natural sea salt made the way nature first intended, with the sea and the sun. ← Korean Chicken And Potato Stew.